Jerez de la Frontera, is the home of sherry. An unplanned visit to Jerez, only a 30 minute drive from Cádiz, in the Andalusia region of Spain was a pleasant discovery. It is well known for its Royal Andalusian School of Equestrian riding and its dancing horses which is second only to the world famous riding school in Vienna. It also has a long tradition of flamenco dancing but it is mostly known as being the sherry capital of the world. While it is not my favorite apéritif, I am a big fan of Jerez sherry vinegar, Spain’s most famous vinegar, so that is how a last minute decision was made to visit Jerez. Click on any photo to enlarge and see a slide show. Now tell me, would you visit a city because you happen to like the vinegar that is produced there? Well I’m very happy I did as the city is everything you think a Spanish city should be. Wander the narrow cobblestone streets of the old quarter and you can’t help but fall in love with Jerez. The city is known for its wonderful architecture of whitewashed buildings with wrought iron balconies filled with pots of jasmine and geraniums, baroque churches, quaint shops, restaurants and sherry bars. Jerez’s 12th century Alcazar, a Moorish fortress, is the oldest structure in the city. The Moors held Jerez for almost 400 years until Alfonso of Castile retook it in 1264. Across from the Alcazar and seen from many parts of the city, the splendid Cathedral of San Salvador was built between the 16th and 18th centuries above a former mosque. Beyond the fortress walls and the cathedral, large squares and pedestrian streets are lined with palms and orange trees. Plaza del Arenal is the heart of the city, the town meeting place since the time of the Moors. At the convergence of several large streets there is a building where a restaurant called El Gallo Azul has been for many years. The almost circular building is one of the most photographed and has become an unmistakable landmark in Jerez de la Frontera. From there you can walk down Calle Larga which is the main shopping promenade. Just north is Plaza Esteve, where the colorful food market, Mercado de Abastos, is located. It is an impressive building of stone with stained glass windows and wrought iron gates and is the oldest market in Jerez. Inside there are over a hundred stalls that sell local produce, bread, meat and some of the best fresh seafood I’ve ever seen. From what I observed, locals seem to have their favorite stalls where they make their purchases for the freshest ingredients. While on our tour of Jerez de la Frontera, we visited González Byass. Located in the very center of town, it is devoted to the making and selling of sherry. It was founded in 1835 and is the most visited of the city’s 36 bodegas or what we would refer to as aging rooms. In 1862, for a visit by Queen Isabel II, the company built a new bodega called La Concha that was designed by engineer Gustav Eiffel. On our tour though several of the aging bodegas, we saw barrels of wine that had been signed by countless celebrities and world figures from around the world. On one bodega, there are 12 casks that hold 6,000 liters and one that holds 16,500 liters. You may be familiar with their brand of fino sherry called Tío Pepe. Its famous logo is a wine bottle dressed in a red Andalusian hat, matching bolero and guitar. Not only does the company produce sherry, they also produce sherry vinegar. It has a tawny flavor that is more complex than apple cider vinegar, more rounded than red wine vinegar and not as sweet as balsamic vinegar. I can say I am happy to have visited the town where my favorite vinegar is made. Jerez de la Frontera was not one of the cities my husband and I had planned to visit on our recent tour of Spain. We were originally going to tour the beautiful city of Seville but because of record heat we made last minute plans to visit Jerez de la Frontera. We are so glad that we visited this lovely Spanish city. Even if you are not a fan of sherry, I encourage you to visit Jerez if you get a chance. It is a charming city filled with a rich history and influences of different cultures. Hopefully we will get a chance to visit Seville in the future. If so, we would probably make a day trip back to Jerez as it is just a short hour’s drive away. This entry was posted in food, lifestyle, photography, travel and tagged Andalusia Spain, Gonzalez-Byass, Jerez, jerez de la frontera, Spain, spain travel, Tío Pepe, the home of sherry. Bookmark the permalink. I absolutely adore your adventurous travels – how special. Hi Mandy, I’m happy that you like following along on our adventures, thank you! Hi David, Being retired does make a world of difference in how you travel. Jerez unexpectedly ended up being one of my favorite cities on our cruise this year. Lovely post – as always! I visited Jerez while staying in Cadiz a few years ago and liked it too. I rarely drink sherry at home but enjoy it sometimes in Spain and there are so many different kinds from pale and dry to dark and sweet. It often seems a good choice with some tapas. But I like sherry vinegar too! Seville is beautiful, you must go – we drove from Seville to Ronda and then to Cadiz. The mountain ranges and white villages were stunning, simply glorious scenery. Hi Kay, It doesn’t surprise me that you have been to Jerez…you are such a traveler. We docked in Cadiz on our cruise and it was a last minute decision to visit Jerez. The only reason that we cancelled Seville was that it was over 100 degrees and that is too hot to really enjoy a visit. Another time, perhaps as I know it is wonderful. 100 degrees was definitely too hot! But hope you get there sometime. It’s a beautiful city. What a nice post Karen, I have only been in Spain for a few days to visit friends and I would love to go to different places. Jerez looks a picture perfect town and I like good sherry and vinegar. Hi Gerlinde, I agree with you about wanting to return to Spain and Jerez was especially nice. We had a wonderful time in visiting Spain but it was too short of a visit. Love the beautiful architecture. I believe I have an unopened bottle of Spanish Sherry in my pantry (a gift from a friend). Probably need to open it sometime and give it a try. Sherry is a little hit and miss with me … some I like, and some I don’t. Wonderful tour! Hi Ingrid, the architecture in Spain was beautiful, so much to admire. From our sherry wine tasting, we discovered many different styles of sherry and like you, I liked some better than others. I can see why it’s easy to fall in love with this beautiful city. I’ll seek out sherry vinegar as it sounds wonderful. A great last-minute change of plans. Hi Peter, We were very happy that we changed our travel plans and included Jerez, it was a delightful city. I tend to use my sherry vinegar more than the others in my kitchen…it is a nice one. We visited Seville when we sailed this itinerary. Hot, but worth seeing. But I’m sorry we missed Jerez! I want to see that too. We’ll be on a cruise that stops there (also Lisbon and Barcelona) in a couple of years, and this is definitely on our list of places to see. Thanks! Hi John, It was over 100 degrees in Seville…too hot for us. Hopefully Seville won’t be as hot if we visit Spain again because I would love to visit it. Do visit Jerez on your next cruise, I know you will enjoy the city. Hi Fatima, Peter’s appointment was definitely important but I do hope you get the opportunity to visit the city of Jerez, you would certainly enjoy it. I enjoyed reading about the sherry industry there. Seems like a beautiful area. Hi Jovina, Jerez was a pleasant surprise, I’m glad we visited and would love to return. Hi Gary, I’m happy that you enjoyed the post about Jerez and sherry…thanks. Thank you Diane, for your nice compliment. BTW, I’m no longer able to comment on either of your blogs. Enjoy your travels. These are the Spanish cities I love. Another wonderful, and in some ways similar, place is Cordoba. Spain is a large and diverse country. Even though I live here I still haven’t seen all of it. I think you made the right choice to visit Jerez. Hi Darlene, Hopefully we will get a chance to return to Spain so I’ll put Cordoba on my list to check out. Thank you for the recommendation. Your trip to Jerez looks to be very successful. Ours wasn’t. We were only offered the vineyard tour and were not allowed to try their sherry witout doing it, the cathedral was shut, we didn’t find the market (which looks great) we had a very ordinary lunch and were happy to go on to Cadiz, which we loved. Oh my Debra, What a difference in our experiences in Jerez. I’m so sorry that yours didn’t turn out well. We docked in Cadiz but didn’t visit so it is nice to know that you enjoyed the city. If we head that way again, we will know to spend some time there. I’d visit for the sherry and vinegar …and today I found a vermut de jerez in a little wine shop in Cataluña, which has to be worth trying. Great pictures and travelogue! Hi Mad Dog, Yes I can see you visiting Jerez for both the sherry and vinegar. At Gonzalez Byass, the winery recommended drinking their vermut (vermouth) in a Sherry glass with ice and a slice of orange. Karen, some of our best villages that we have visited were not planned. Much to my surprise, they are some of our favorite places. What a wonderful visit to Jerez and your photos are beautiful! Thank you for your nice compliment Pam, I’m glad you enjoyed the photos. Our last minute decision to visit Jerez turned out to be such a good one. I’m glad you have had the same kind of experiences when traveling. What a clever idea to visit Jerez instead. The heat in Spain is very strong and it sounds like you encountered a very charming place. Hi Lorraine, While I’m sorry that we didn’t get to visit Seville, with a temperature of over 100 degrees, it would not have been a very good experience, Jerez on the other hand was a delightful city and the weather was perfect. I have tasted and drunk the best of sherries and can manage to enjoy’ the very driest ! That in no way means I would at any possible time abstain from a visit to Jerez. Again your photography is the best I have ever seen . . . it will be reposted to friends and colleagues and I do thank you for the ‘nudge’ to do a lot more homework !! You are so sweet Eha, and I truly appreciate your kind words…thank you! Why, yes I would! Sherry vinegar is a magical ingredient. I have no problem with your choice! Sometimes the better places are the least populated. I love sherry and I love sherry vinegar and there is such a difference between brands. Hope you found the right stuff! Hi Abbe, Yes our decision to visit Jerez was a good one. The visit to Gonzalez Byass was especially interesting…there were so many different types of sherries to try. What a beautiful wine city! Thanks for sharing, Karen. Thank you Angie, I’m always happy to share our travel adventures and Jerez was delightful. I’d give up Seville for Sherry any day, so I think you choose wisely. Jerez looks to be the type of Spanish city I’d enjoy visiting. The Mercado de Abastos is the kind of place I could spend a couple of days at. That seafood looks so good. I could tuck into a plate of those shrimp and a glass of chilled Fino every day. Now I need to go back to Spain! What a lovely post. I just purchased two vinegars from chefshop.com. One I decided would be better cleaning out pipes, but the other I’ve already ordered more of. It’s Espelt de Garnatxa. It sounds exactly what you described. no regular vinegar, but not sweet like balsamic. Turns out it’s from Catalon. I hope you get a chance to try it because it sounds so similar!!! Thank you for your nice compliment Mimi, I’m glad you enjoyed the post about Jerez. Thank you for the tip about the Espelt de Garnatxa vinegar. You gave me a chuckle about some vinegars being better for cleaning drain pipes rather than using on food…some of them are way to harsh. Sherry is a favorite of ours, particularly very dry sherry. Your descriptions make me think I should go back to keeping some sherry vinegar on hand as well. I just went quickly through your travel posts: quite a whirlwind trip you managed, with so many sightseeing locations and so quick to see each one! Your photos are very enjoyable. I appreciate your nice compliment Mae, I’m happy that you enjoyed my posts on our adventures in England, France, Portugal and Spain. Yes, do try to keep some sherry vinegar on hand, it is one of my favorites…especially those from Jerez. I hadn’t heard of sherry vinegar before reading your post, but it must be delicious since you made your way to Jerez to sample it! What would be your recommendation for how best to use it? Hi Atreyee, I most often use sherry vinegar when making a vinaigrette for a salad. I also add a few drops at the end of cooking black beans for example, the acid brings out the flavors in the dish similar to the way a squeeze of lemon often enhances a dish. Thanks for this tip Karen, I am going to try your sherry vinegar as both my new salad dressing and for those black beans. Amazing pictures Karen! Would love to go to that market too. Thank you Amanda for your nice compliment on the photos. The market in Jerez was really nice. I use sherry all the time for cooking and marinades, I love the flavor it imparts. I must try the vinegar! This looks like and enchanting town, I really enjoyed all the beautiful pictures and your commentary Karen! I appreciate your kind words, Jenna…thank you. Do try sherry vinegar, a good one is especially nice when making a vinaigrette. I will, I bought some the other day, thanks Karen! Hi Kathryn, Do add Jerez to your bucket list. I know you would enjoy a visit. I’m glad you agree about sherry vinegar, it really does bring out the flavors in lots of recipes. What a gorgeous place to visit and you did it justice with your photos. I was in Andalucia a few years back but missed this town. Thank you Amalia, I’m glad you enjoyed the photos from Jerez. I do hope you get a chance to visit if you return to Andalusia. I’m glad to know you would visit Jerez because of the vinegar as well Fida. The city was so charming…thank you for your compliment on my photos. I lived in Spain, in Madrid, many moons ago, and I loved Jerez. (And I love sherry!) So much beauty all over Spain! I would love to be a that colorful outdoor market. Beautiful photos! Thank you for your compliment Valentina, I’m happy you enjoyed my photos from Jerez. We loved visiting Spain and hope to get the opportunity to return. Interesting about sherry. It looks like a great place to vacation. Your photos are beautiful as always, Karen! Hi Pam, Our visit to Jerez was delightful and I really did enjoy the visit and tastings at Gonzalez Byass. I learned a lot about the different types of sherries. I love that vinegar also! Beautiful photos of Jerez and wonderful to know more about the sherry capitol of the world! Hi Susan, Even though I always have sherry vinegar in my kitchen, I didn’t know Jerez would be such a delightful city to visit. Thank you for your compliment about my photos. Great photos! I enjoyed being able to virtually visit Jerez de la Frontera via this post. Thank you for your nice compliment Sheryl, I’m happy to know that you enjoyed our travels to Jerez. What a lovely city, thank you for sharing your experiece with us. I have been known to visit cities for food items they are famous for too! Hope you were able to bring home some of that awesome vinegar. I am living vicariously through your travels. Such great photos! I’m happy to have you following along on our adventures Debra. Thank you for your nice compliment about my photos of Jerez. What a beautiful photo tour of this lovely place! The architecture and all of the bright colors are wonderful to gaze on. Thank you once again for your sharing your travel sojourns Karen! I’m trying to comment a second time and hope it comes through this time. I simply wanted to say thank you for sharing your wonderful travel sojourns to such interesting and beautiful destinations. It’s always so enjoyable to read about these places! Thank you! Hi Roz, I’m so sorry to be answering your comments so late. I just found your comments in my spam file…I can’t imagine what happened. Thank you for your kind words about my travel adventures, they are much appreciated. 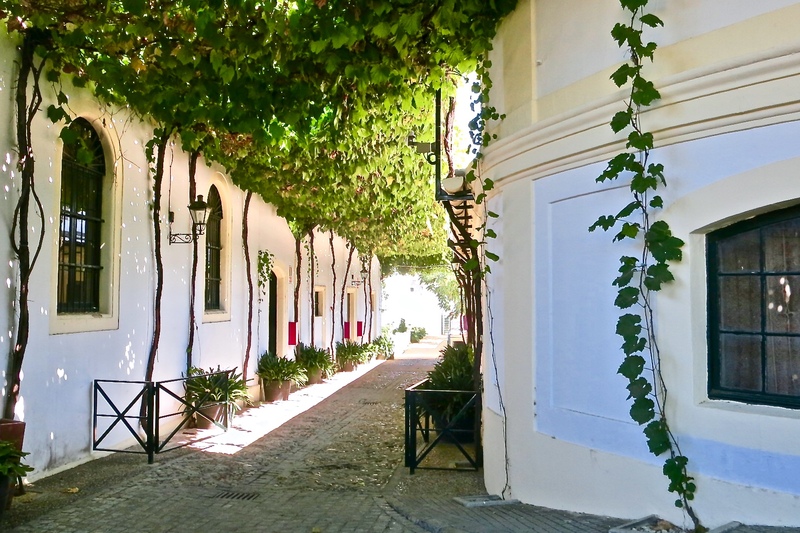 What a lovely glimpse into Jerez! Thank you for sharing, Karen. I’m always happy to share with you Ksenia, I’m glad that you enjoyed the post about Jerez…thank you! Karen, no, I’ve never visited a place for its vinegar! 😀 I don’t care to drink sherry either, but I picked up a few beautiful little sherry glasses years ago because a dear friend enjoyed sipping sherry. I go through a fair bit of it in cooking, though, so always have a bottle on hand, always a drinkable one in case someone requests it. Hi Jean, It is not surprising that you might not visit a city for its vinegar or sherry…I’m sure that there are many others like yourself. 😀 I really thought the city was lovely and I learned a lot from the sherry tasting. Some I liked, others not so much. Funnily enough I gave my daughter some Palo Cortado as part of her Christmas presents. 🙂 🙂 We mostly saw this city in pouring rain, Karen, and were still entranced by it. Hi Jo, Your daughter must have been very happy with her present of the Palo Cortado. You are right, even in the rain I think Jerez would be a charming place to visit. We were extremely luck on this year’s travels, not one drop of rain. That has not happened in a very long time. Lovely photos, it looks like a great place and drinking sherry in Spain is like nothing else! I adore Jerez sherry vinegar. In fact, there’s a bottle in my pantry right now. It has a lovely natural fruity sweetness that goes great in salads or added in just a splash to vegetable soups. How wonderful that you got to visit the region where it originated.